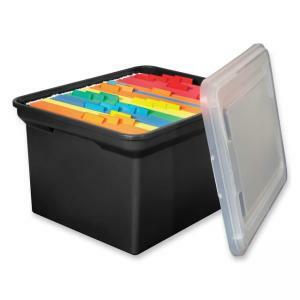 Innovative Storage Design Storage Box - 10.22" x 14.13"
Stackable file tote offers a textured base and snap-on lid to secure hanging folders. Design features a clear lid for easy identification and built-in ridged edges to hold the folders. Plastic file container has a 50 lb. capacity. File folders are sold separately.